“Rustic” is a beautiful combination of country cottage and farmhouse decor. Rustic kitchens add instant warmth and charm to a home, and are equally appropriate for both large and small spaces. To create a contemporary cozy look, check out these decorating ideas… No ceramic roosters or toile fabric doilies here! Start with exposed wood beams on the ceiling and a muted color scheme where natural materials will dominate. Salvaged wood with imperfections like knots, weathering, and grooves make the kitchen more appealing. Add a rough-hewn plank, tumbled stone or polished concrete floor. Consider an artisan stone oven or a wood-burning stove in addition to modern appliances. Dark wood can be too imposing for smaller kitchens so choose bleached or primitive painted light wood (oak or pine) cabinetry instead. When combining wood finishes, make sure they are complementary to each other. If you paint, stick with country colors like blues, browns, greens or muted reds. Distressing is optional since Type A personalities may not be able to tolerate intentionally chipped paint. Custom cabinets can also be created to mimic barn doors and a vibrant Shaker-style island can become the room’s focal point. Matte metal and industrial hardware are most appropriate for rustic kitchens because bright and shiny would clash badly. Exposed brick can be a great backsplash or accent wall. Install open shelving to display baskets and kerosene lamps as well as a hanging pot rack for showing off period copper or iron cookware. Add a farmhouse table, metal bar stools or a rag rug to complete the look. Be sure to blend old with new for a rustic space that is personal to your family. You don’t have to live in a rural area to bring rustic elements into your kitchen because Mother Nature is truly timeless. 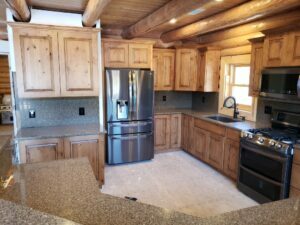 Cornerstone Cabinet Company uses OakCraft, Shiloh, Eclipse and other fine cabinet manufacturers to offer a full range of inviting possibilities.